The post Liver Disease in Dogs: Symptoms, Causes and Treatments by Jennifer Lesser appeared first on Dogster. Copying over entire articles infringes on copyright laws. You may not be aware of it, but all of these articles were assigned, contracted and paid for, so they aren’t considered public domain. However, we appreciate that you like the article and would love it if you continued sharing just the first paragraph of an article, then linking out to the rest of the piece on Dogster.com. A multi-purpose organ, the liver plays an important behind-the-scenes role in our bodies … and the same is true for our dogs. The liver detoxifies blood, metabolizes energy sources, produces acids necessary for digestion, stores vitamins and glycogen, and manufactures proteins for blood clotting. Because of its behind-the-scenes role in so many of our pet’s bodily functions, liver disease in dogs can manifest itself in a variety of ways. Let’s learn more about the symptoms, causes, treatments, diagnosis and prognosis for liver disease in dogs. 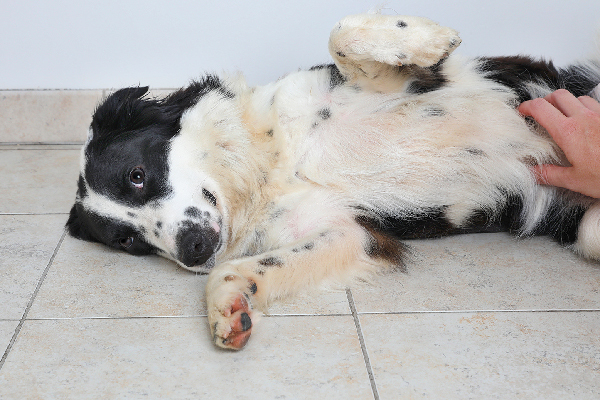 The symptoms of liver disease in dogs can be hard to spot. Photography © GeorgePeters | iStock / Getty Images Plus. In most cases, if your beloved pooch is sick, you’ll know it. But when it comes to liver disease in dogs, your pup may not show many obvious symptoms — or, worse, he may not show any symptoms at all. “Most symptoms of liver disease are non-specific, with the possible exception of jaundice or yellowing of the eyes and skin,” explains Dr. Steve Weinberg, DVM, founder of 911 VETS. The symptoms of liver disease in dogs will also vary greatly depending on whether the disease is acute or chronic, and may include vomiting, diarrhea, weakness, lethargy, fever, anorexia, weight loss and clotting problems. In the case of clotting, your pet may have blood splotches or bruising on his skin and mucous membranes, and yellowing of the skin and in the whites of his eyes. “One of the main functions of the liver is detoxification, so the symptoms of liver disease in dogs usually revolve around vomiting, particularly bile and diarrhea. When the liver is overburdened, that’s how it’s helping your dog get rid of poison in the body,” explains Dr. Marty Goldstein, DVM, author of The Nature of Animal Healing and founder of Nature’s Blend dog food. You may also notice your pet has a bloated stomach, which is a symptom of more advanced liver disease in dogs. According to Dr. Weinberg, liver disease is a broad description of a variety of conditions, and may include infection, autoimmune, toxicity, neoplasia and congenital conditions. The good news is that no specific breed has a higher risk of these issues. “The only prevention is to avoid known toxins, and to test lab values on prescriptions that may cause liver damage, such as NSAIDS,” he adds. Generally speaking, when it comes to preventing illness and disease in your pet, including liver disease in dogs, one of the best approaches is always a healthy diet. According to Dr. Goldstein, an improper diet — especially foods that contain chemicals and preservatives — can damage the liver. According to Dr. Weinberg, liver disease in dogs is initially diagnosed via blood testing, and your veterinarian may then perform an ultrasound or nuclear medical imaging. A biopsy often determines the final diagnosis. “The treatment will depend on the specific diagnosis that’s actually causing the liver disease, and may include antibiotics, bile thinners, vitamins, liver supplements such as SAM-e or Denamarin, fluid support, enteral feeding and possible surgery to correct malformations,” he adds. Silymarin (Milk Thistle) and SAM-e (S-adenosylmethionine) are natural compounds that have been scientifically shown to help liver damage heal, Dr. Goldstein notes. What is the Prognosis for Liver Disease in Dogs? “The liver is a very regenerative organ, so unless the liver damage is severe and widespread, usually the prognosis is good,” Dr. Richter concludes. Thumbnail: Photography © Kosheleva_Kristina | iStock / Getty Images Plus.